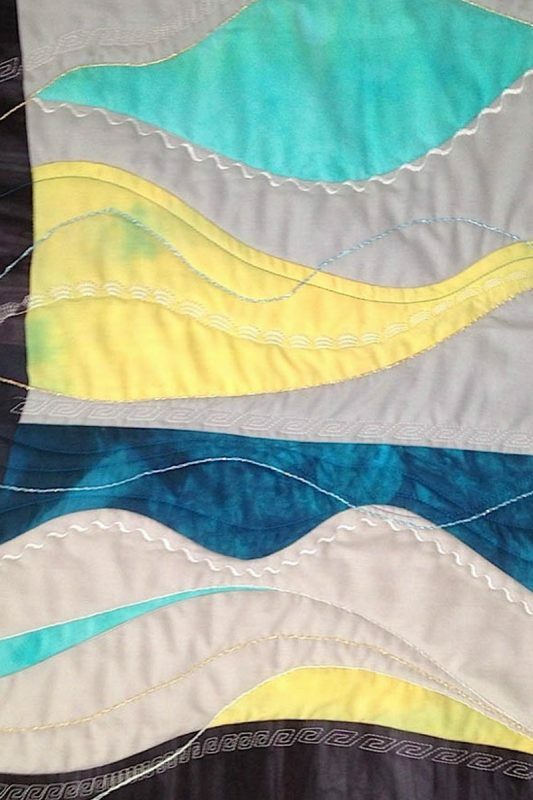 Embellishing Your Contemporary Quilts with the BERNINA Stitch Regulator and decorative stitches by Roxane Lessa. 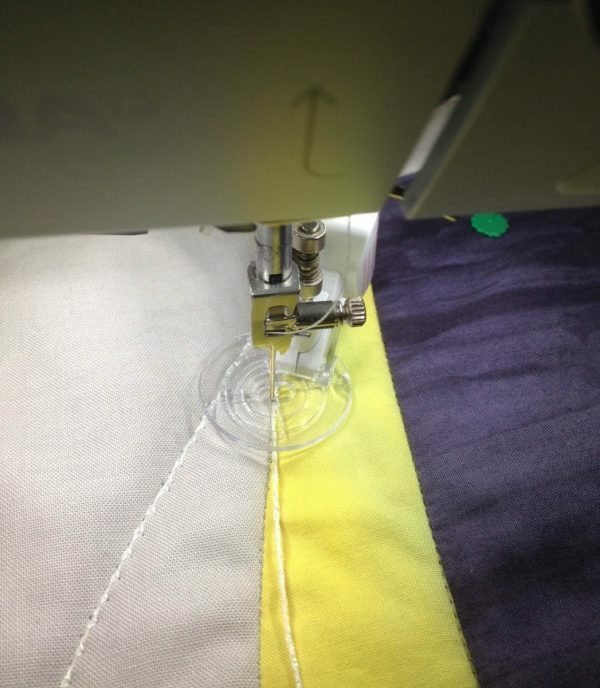 When I first started using my BERNINA 750 QE, I was pretty much a free-motion kinda gal. 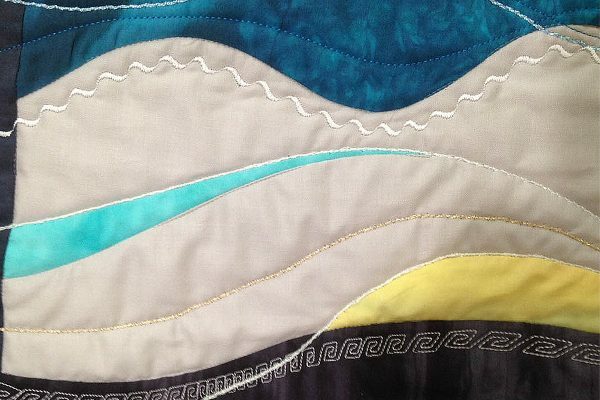 I do all my own free-motion quilting on my art quilts. But lately, I discovered that there are so many cool decorative stitches on these machines for quilt embellishing. I wondered how can I use some of those stitches in a more modern way that fit my style? So I began to play…. I found a small curved pieced top that I wasn’t too fond of, so I wasn’t afraid to “wreck” it. I put a fine bobbin thread in my bobbin and chose a neutral white polyester thread for the needle. Mimicking the curves already found in the piece, I used a serpentine stitch—and I liked it! So I repeated it, but made it shorter and smaller by reducing the width and length of the stitch. Fun! Now I was opening up the stitch folders madly on my touch screen looking for more cool stitches. I found this geometric stitch that seemed to work well. Again, I played with the length, making it larger, then smaller, then larger again. This helped create a lot of rhythm and movement. The trick is to choose stitches that aren’t fussy, flowery or cutesy. Simple and clean designs work with the modern quilt aesthetic. Now to add a bit of bling! Again, keeping it simple, I echoed the lines in the piece, and couched down some Ricky Tims Razzle Dazzle thread. I put that thread in a cup next to my right hand. Using my BERNINA Stitch Regulator (BSR) foot, Feed Dogs down and a small zig-zag stitch, I was able to couch down this thread easily by guiding it with my left index finger. 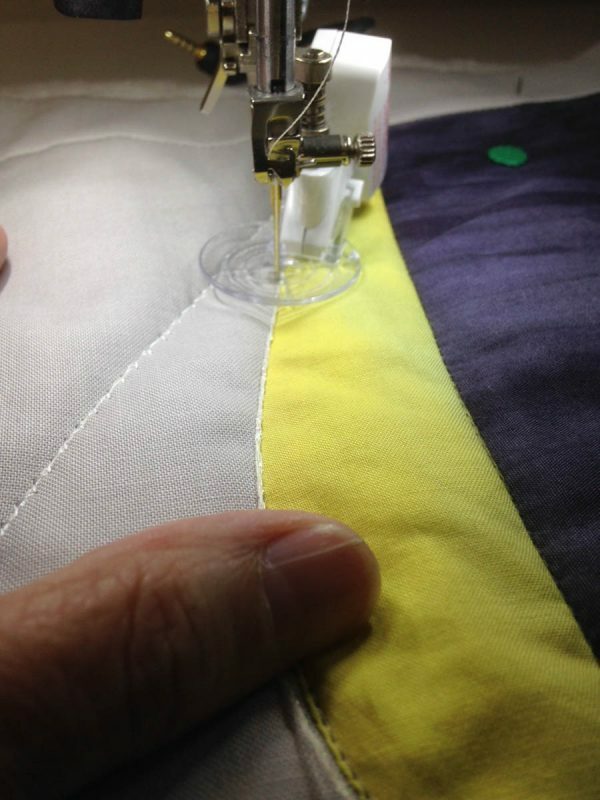 You can use invisible or any thread on the top for couching. Oh, and one more thing—the BSR foot has 3 feet attachments and you can use any of them to couch with, but I found the clear circular foot holds the thread and gives you full visibility as your are couching. 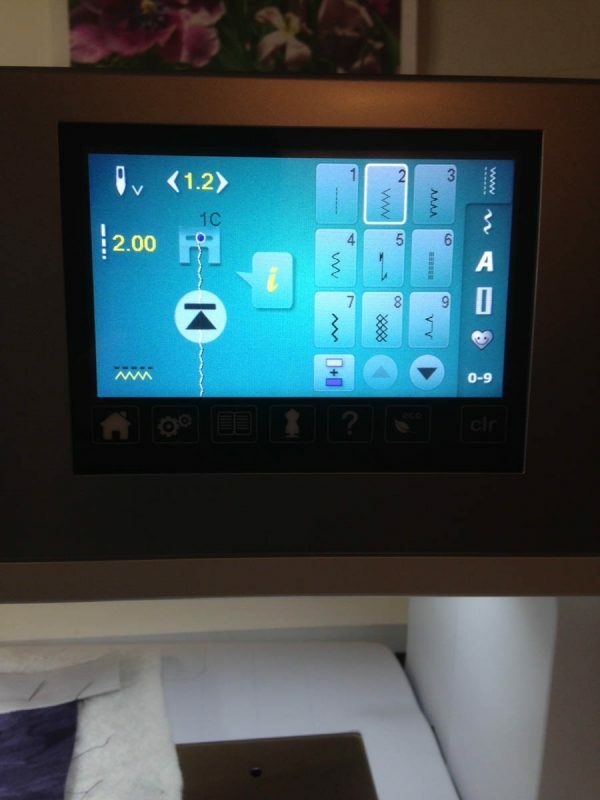 Get the most out of your machine’s capabilities, and have fun embellishing your work! I love this! I’d like to try this on my table runner. 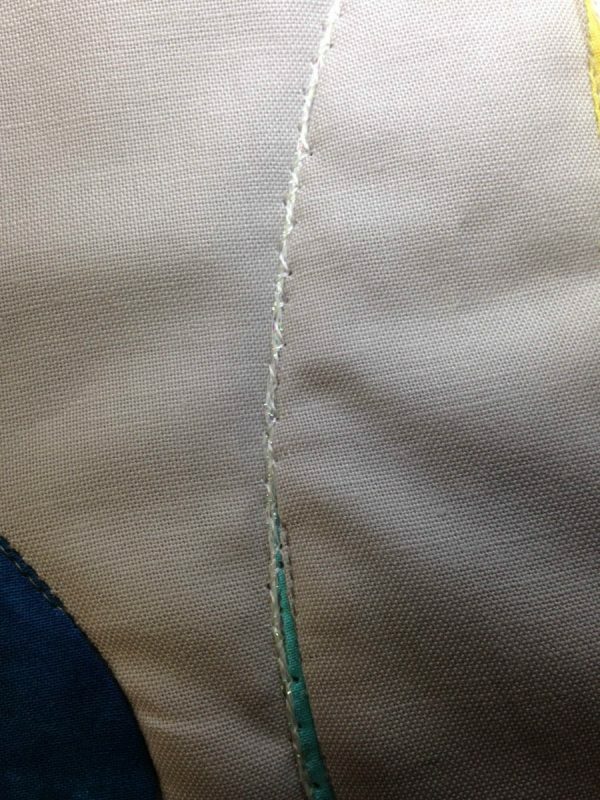 I love my BSR on my 440QE and never thought of trying out some of the decorative stitches for quilting. I, too have a quilt top that I made as part of a mystery quilt challenge with my quilt group back in January that I do not care for. This may be just what it needs to make it a quilt that I love. Same here! Have had my QE440 with BSR and love it! I have used it for years……will certainly try some of the decorative stitches too. This opened my mind to new ideas. Thank you. I have thought of doing this but wasn’t sure if you use the decorative stitches just on the quilt top or through all layers. Looks like you did all layers.